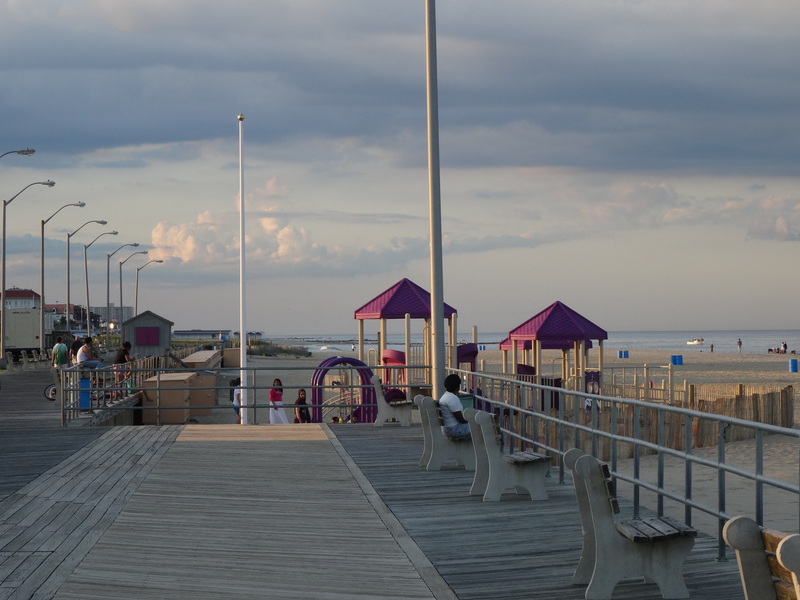 We headed into New York City about 8pm following a quick drive through Asbury Park, New Jersey, the small boardwalk city where Bruce Springsteen got his start. 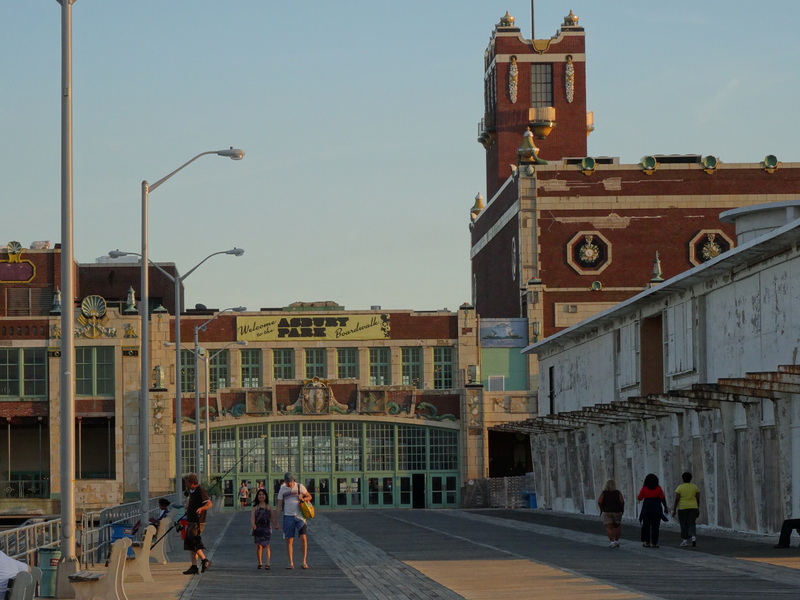 Asbury Park is also the subject of Springsteen’s City in Ruins written in 2000, but included on The Rising album, which primarily consists of songs inspired by and written after 911. Although there were still a few remnants of the rundown, somewhat scary, boardwalk town that I had visited with my sister in early 1981, it was very evident that a successful revitalization effort had been underway for some time. 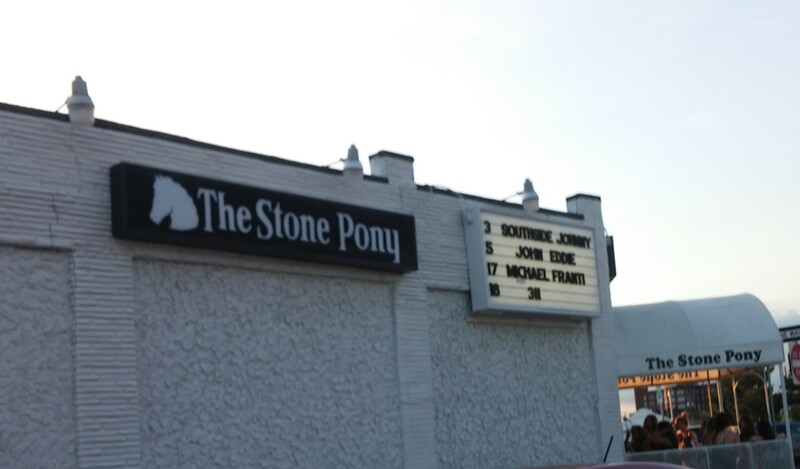 There were people strolling the shops in town, cycling and jogging along the paved path that bordered the beach, and I was thrilled to see the line-up on the marquee of The Stone Pony – would have loved to have seen a show! 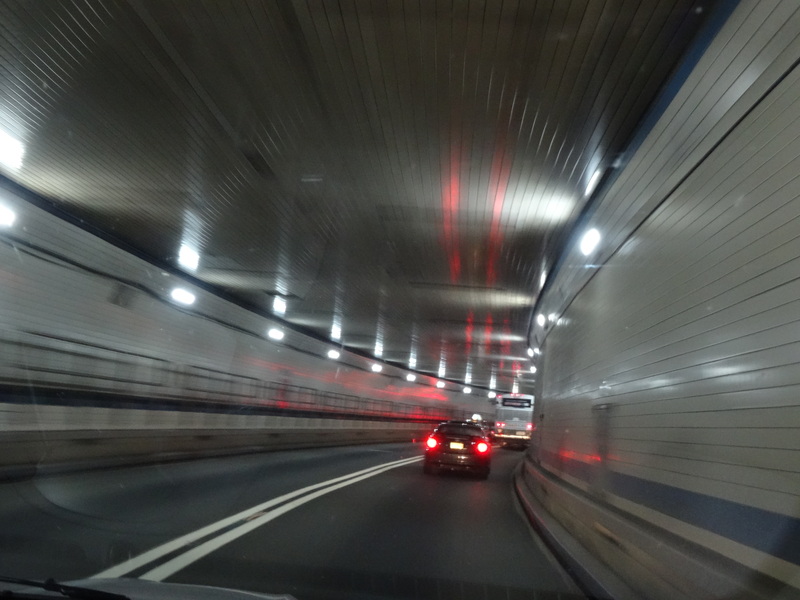 We knew driving the “Escape Mobile” into the heart of NYC would be tricky, but with me navigating and Trey’s driving skills, which I realize now have a purpose, we easily traveled into the midtown east section of Manhattan. An open parking space in front of the apartment building made for easy, quick unloading. We’d researched parking options in advance and decided to go with the cheapest, but less convenient, option of parking at LaGuardia Airport. So, after unloading, we drove to The Parking Spot adjacent to the airport, and with an internet coupon secured parking for $17 a day. There just so happened to be a Metropolitan Transportation Authority courtesy desk as we entered the airport, so we received clear instructions as to which bus to take to the nearest subway stop and we both purchased 7-day unlimited MTA passes. Easy breezy! As, we soon discovered, is the New York City subway system – as long as you have a MTA pass and a smart phone you can easily get anywhere in the city. Our apartment was tiny, but we loved it the experience of what it would be like to be young and living in New York. 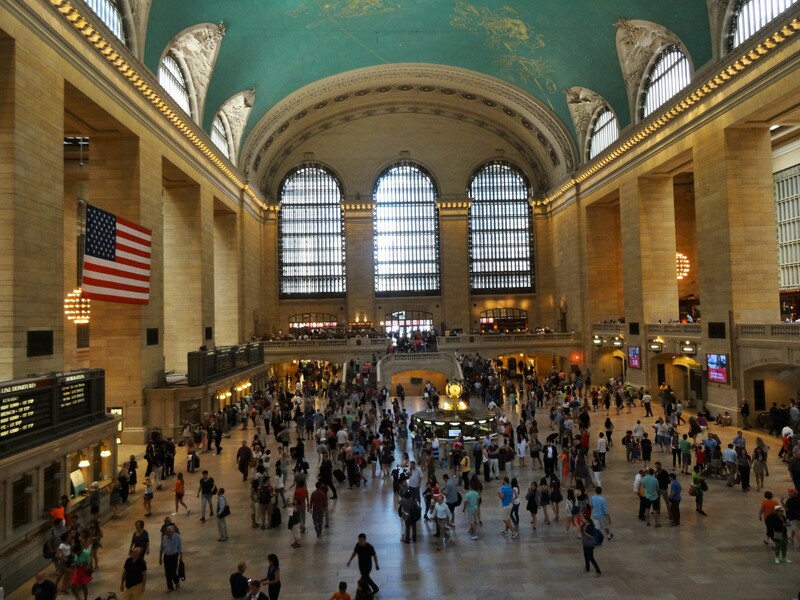 Plus, its great location in the 53rd & Lexington area was walking distance to a lot of what we wanted to see and on the major subway lines. 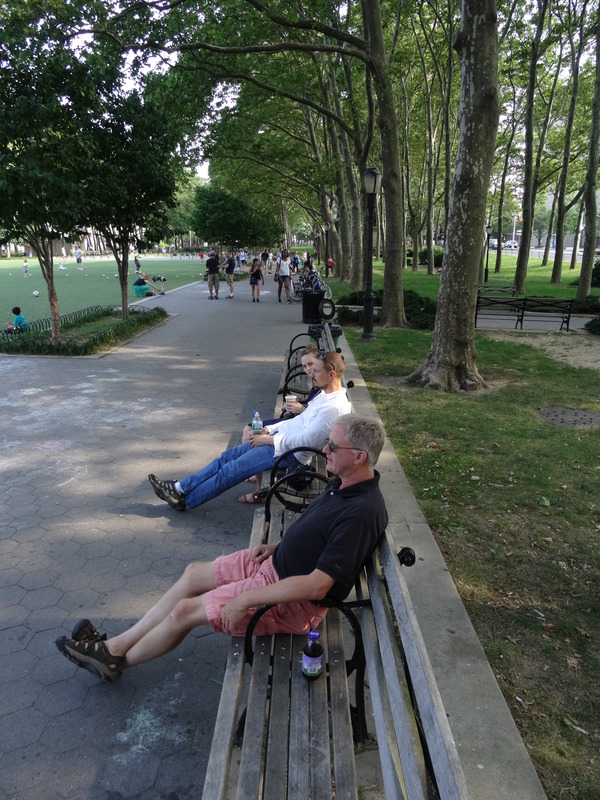 We awoke to our first full day rested and filled of excitement to explore New York City together. After a hearty breakfast at a nearby diner, we continued on foot to the East River where we stumbled upon the house where Irving Berlin spent the last 40 years of his life. 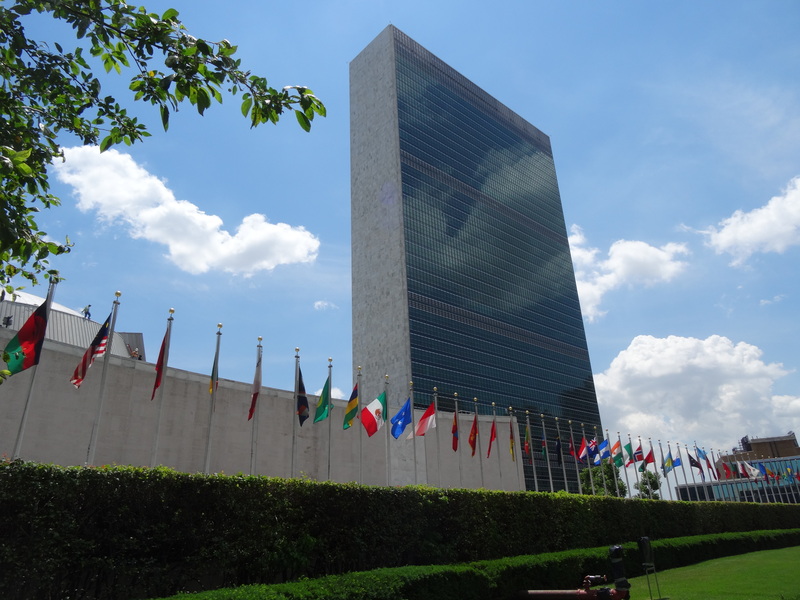 We then headed south to the United Nations complex only to find it blocked off with construction fencing due to extensive renovations, but were able to catch a few glimpses. 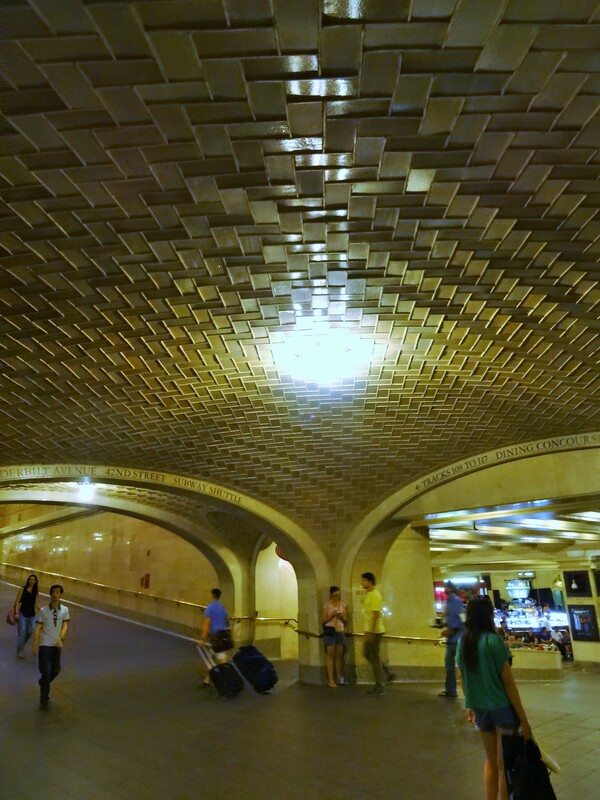 Next, it was over to Grand Central Station to view its beautiful interior and domed blue celestial ceiling. Our daughter later told us that there is one tile that had been left untouched when the roof was last cleaned to show how dirty it had gotten. She also told us of the domed corridors that were specifically and acoustically designed to allow two people to converse from opposite corners. This was just too intriguing so we had to try it out on a later subway stop there. 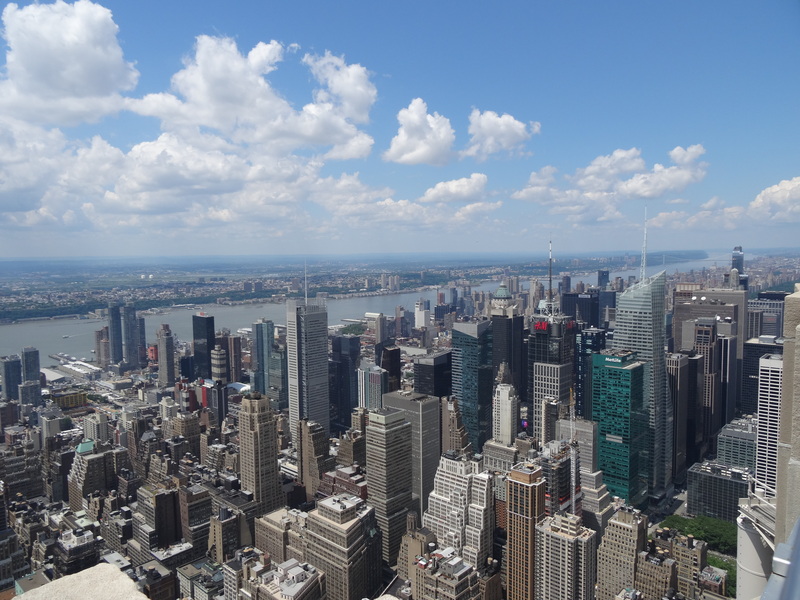 We then headed to the Empire State Building with the intention of just photographing it, but quickly decided to go ahead and pay the $29 to take the elevators to the viewing deck. The area leading to the first elevator is a museum designed around the path where tourists wait in line. Once you’ve bought your ticket, you’re handed an audio device that guides you through the exhibits as you wait. The audio guide and exhibits were perfect to keep you entertained while waiting, and provided the fascinating history of the building from conception, construction and conservation. Trey found it quite amazing how quickly it was built in the middle of the great depression, and how they used a mobile assembly line moving rail lines on each floor as they built upward. We were also lucky to visit the viewing deck on a beautiful, clear day, so the 360 vistas were amazing. 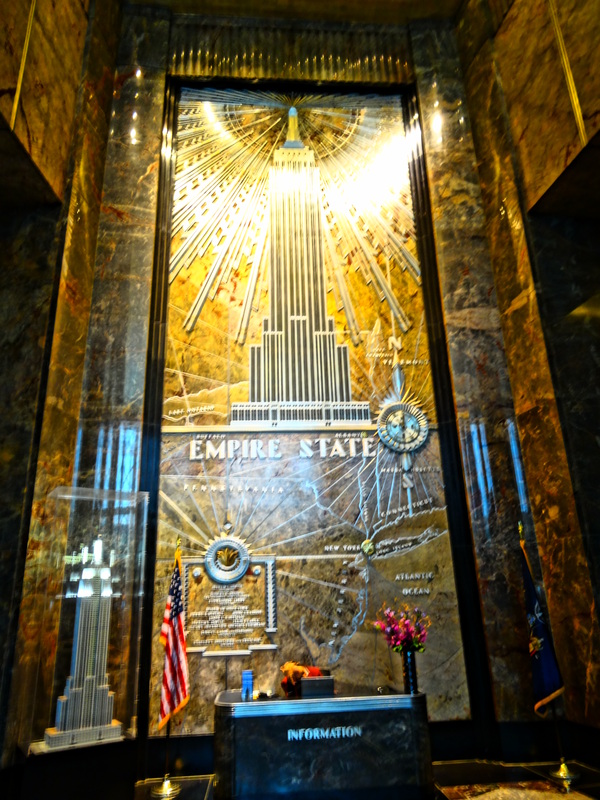 The Empire State Building was well worth the effort and provided us a unique perspective of the city. Following a quick satisfaction of Trey’s Chipotle addiction, we headed once again into the depths of the subway system for a ride downtown to the World Trade Center site. Lovely tribute. 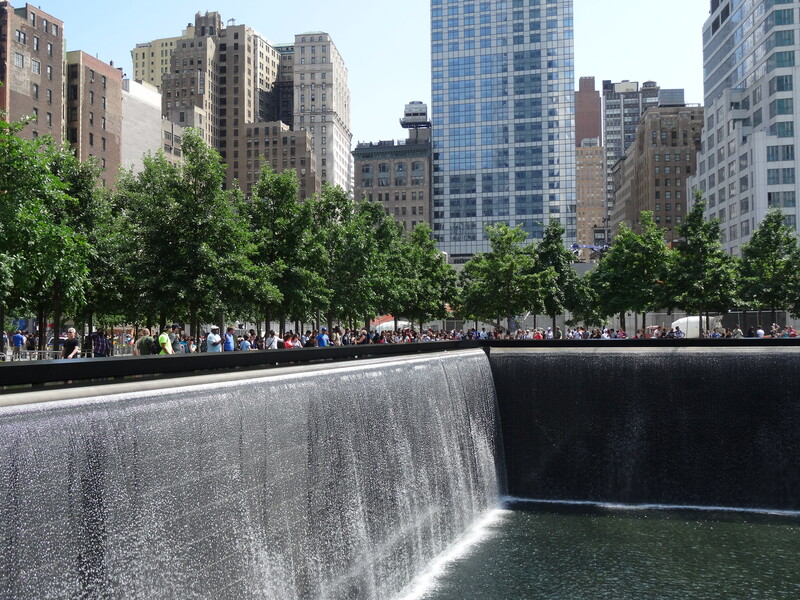 The cascading fountains built on the footprints of each tower descend from every direction into a reflecting pool. 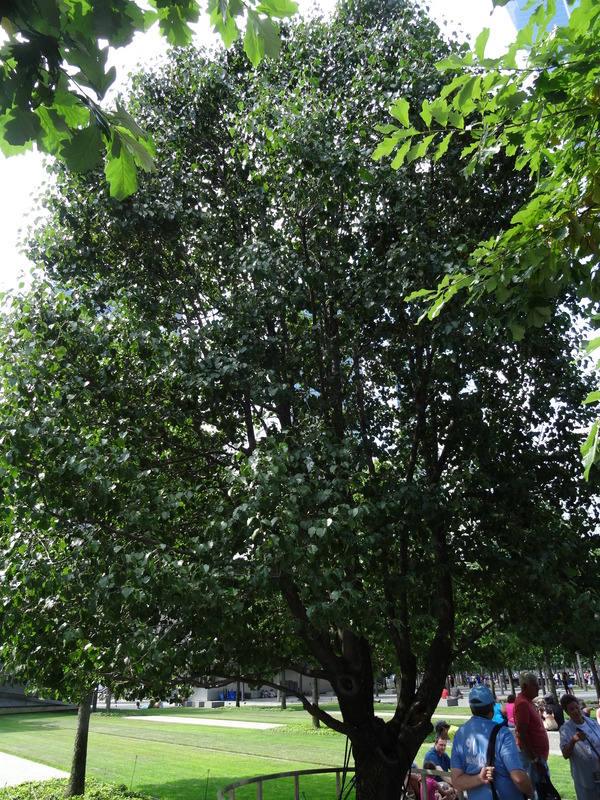 The sole surviving tree discovered during the recovery effort was rescued and nursed back to health by the New York City Parks Department and replanted on the 911 memorial grounds in 2010. 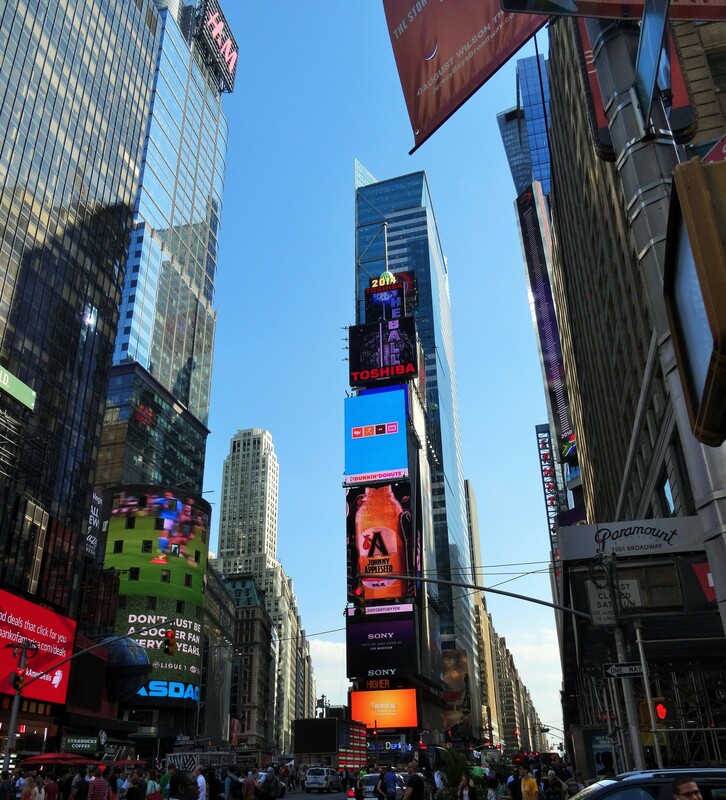 Following the ride back to midtown, a shower and a snack, we presented ourselves once again to the streets of NYC all polished up nicely for the evening and headed to the theater district for Phantom of the Opera. We emerged from the subway to find the theater district so packed with people that some, including us, were forced into the street making the outside lanes of traffic impassable. Horns blowing, people talking and yelling, street musicians playing, sirens wailing – it was total, beautiful chaos as we slowly edged our way through the people gauntlet to the Majestic Theatre. 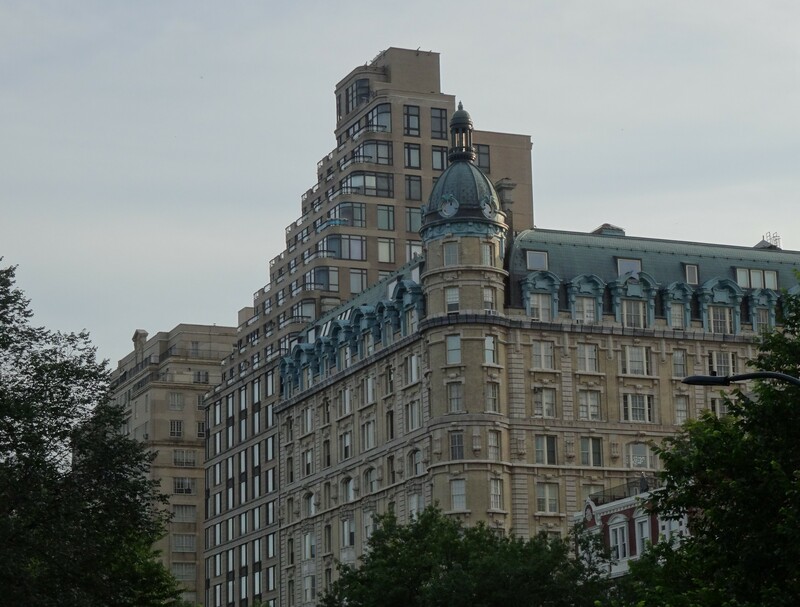 We loved the production of Phantom of the Opera, and discussing it while also watching the vast array of characters on the walk back up to midtown. Knowing we’d not be able to go to sleep, we walked past our apartment to a lively Italian restaurant/piano bar for dessert. We relived the day over tiramisu and sing-alongs, not believing how much we had done in a day and how long we had lasted – it was 1 a.m.
We ventured out on our bicycles to explore Central Park – riding through the streets was a bit of a scary experience and not something that I became comfortable with throughout our stay. 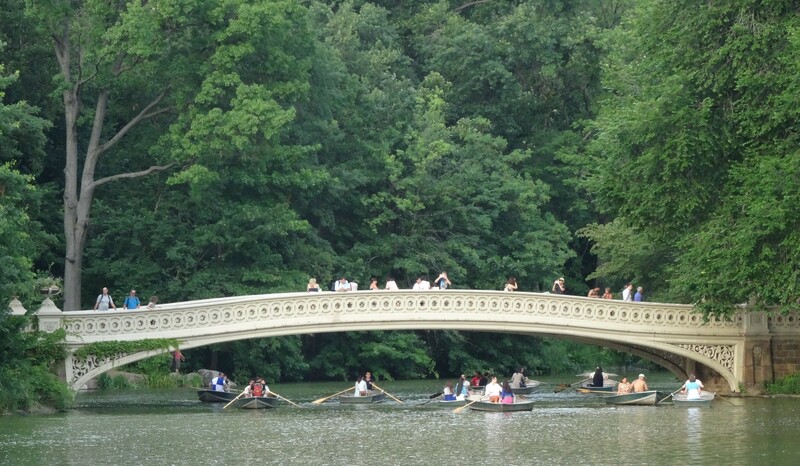 However, Central Park has a great 6.5-mile bike path that circles the park. It was a great way to enjoy the natural beauty of the park and all it has to offer. 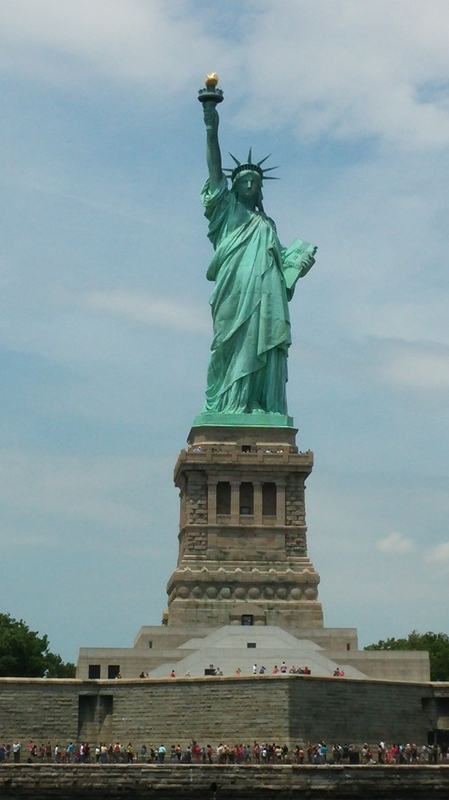 What a tremendous resource for the people of New York, and they do seem to appreciate it fully. 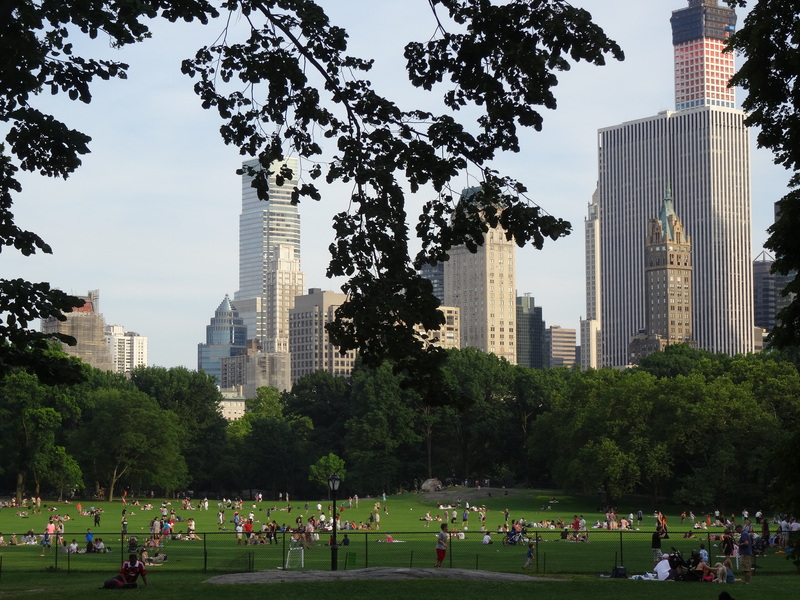 We returned to Central Park later in the week to experience it by foot and explore sections where our bikes were not allowed. 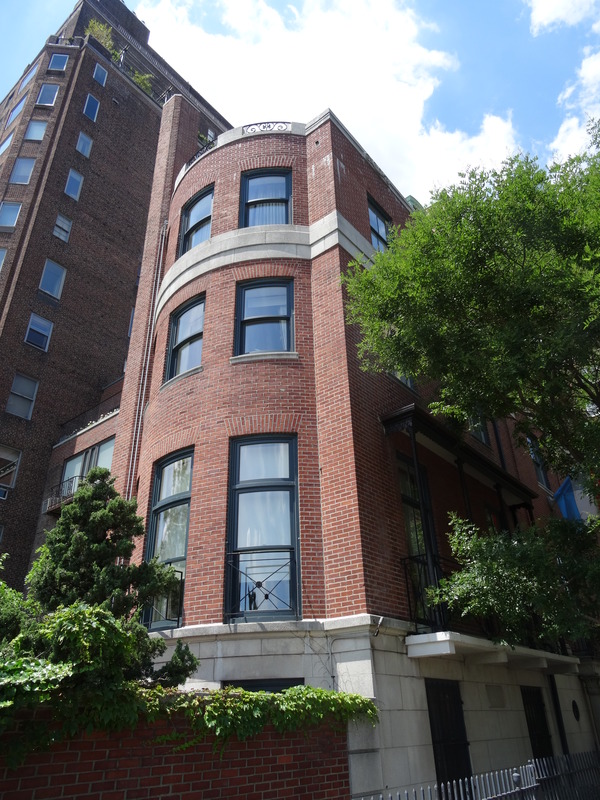 We also had fun admiring the beautiful apartment homes along Central Park West. 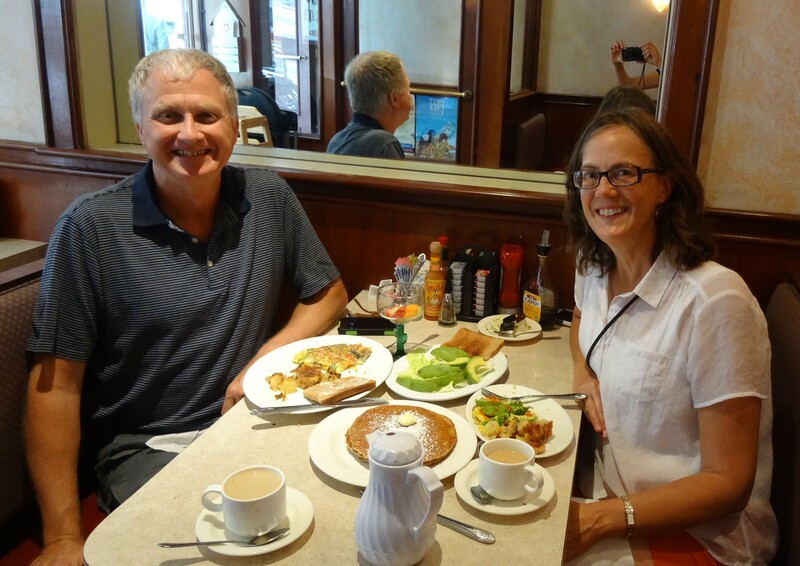 We’d made plans to meet our daughter and her boyfriend for brunch at a popular Polish restaurant in the Brooklyn Heights neighborhood. Lindsey had traveled to New York following her work commitments in Washington D.C., and John was in the city for a photography seminar. Teresa’s was fabulous, and it was fine that we stuffed ourselves because its located very near the promenade walk along where the Hudson and East Rivers meet. The promenade sits above Interstate loop 278 and offers great views of Battery City, the Brooklyn Bridge, and a Civil War era fort. 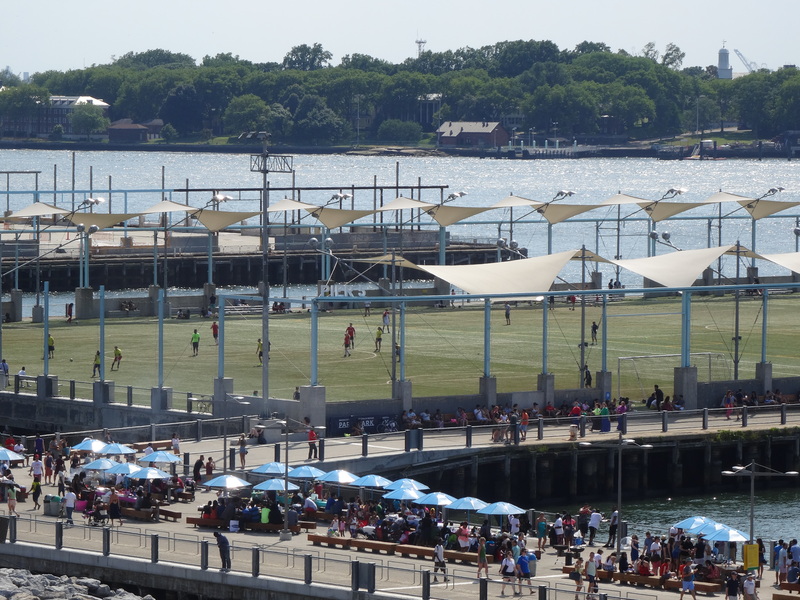 We loved the unique reuse projects of the old piers that line Brooklyn’s shoreline – where once stood a dilapidated pier, there were now soccer games taking place! 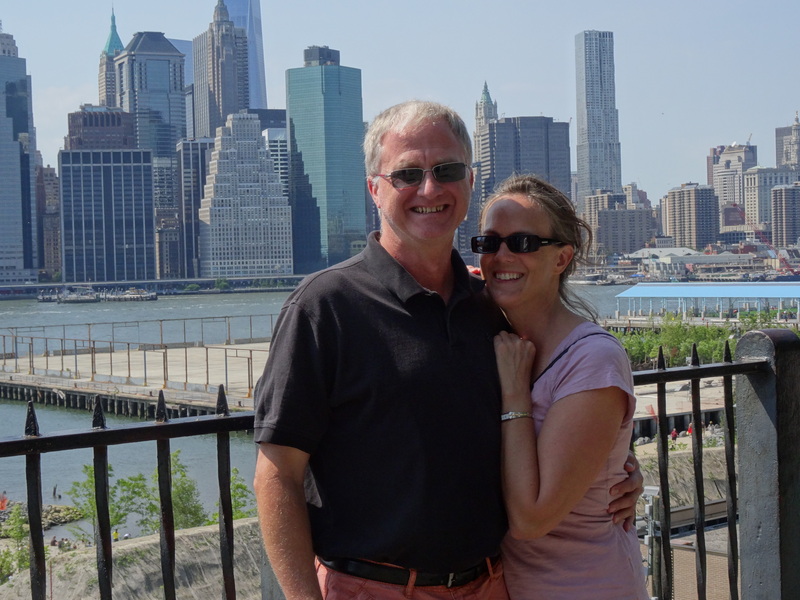 Having lived there for several years, John shared his knowledge of the history of the neighborhood as we strolled the streets in awe of the beautiful row houses’ architecture. The 30th was Trey’s birthday and we chose to celebrate with a special tour of New York City. The tour we chose circled the island aboard the gorgeous boat, The Manhattan, and was led by a member of the New York chapter of the American Institute of Architects. 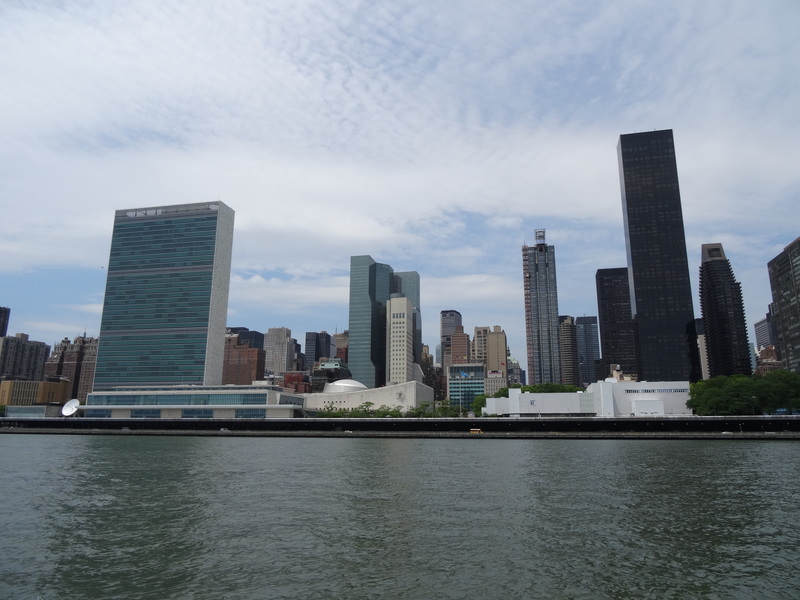 It was a great way to learn how the city evolved, along with some interesting tidbits unique to New York architecture and on specific buildings and bridges. The views from both the Hudson and East Rivers were spectacular! We all thought the 3-hour cruise, which included hors d’ oeuvres and drinks, was well worth the time and money. 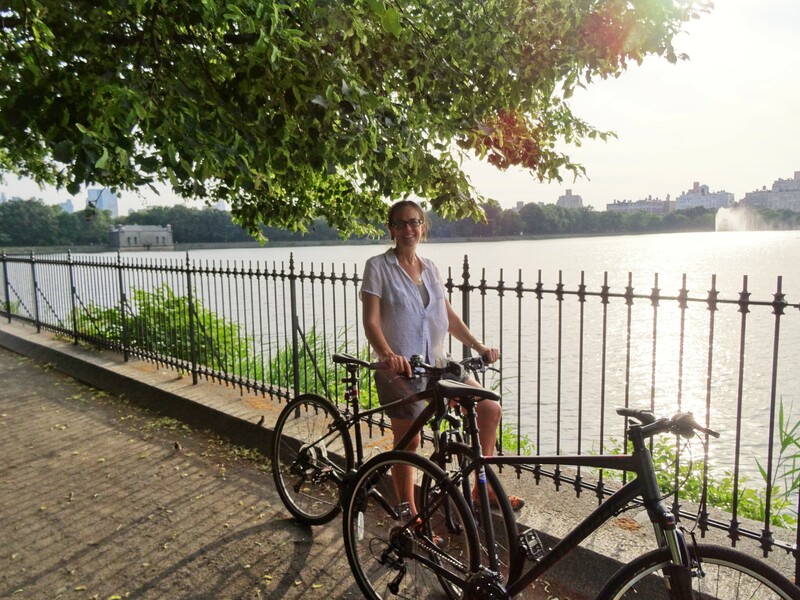 Lindsey had met us at our apartment and rode with us to the Chelsea Piers for the tour. 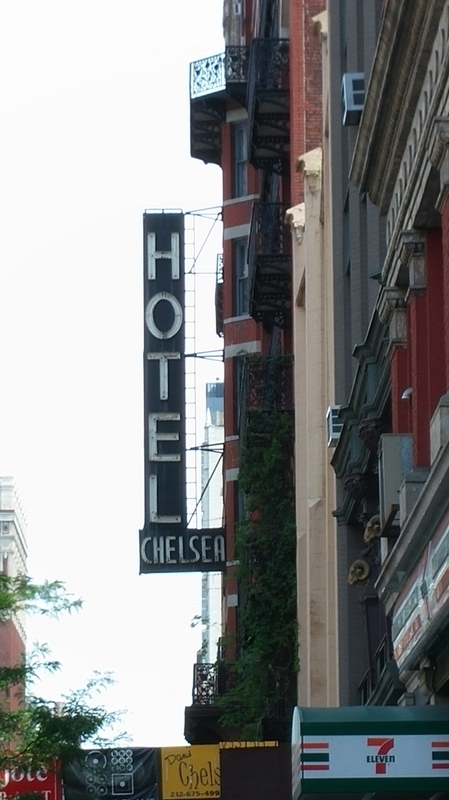 Too caught up in looking for breakfast, we walked past the infamous Chelsea hotel without realizing it. 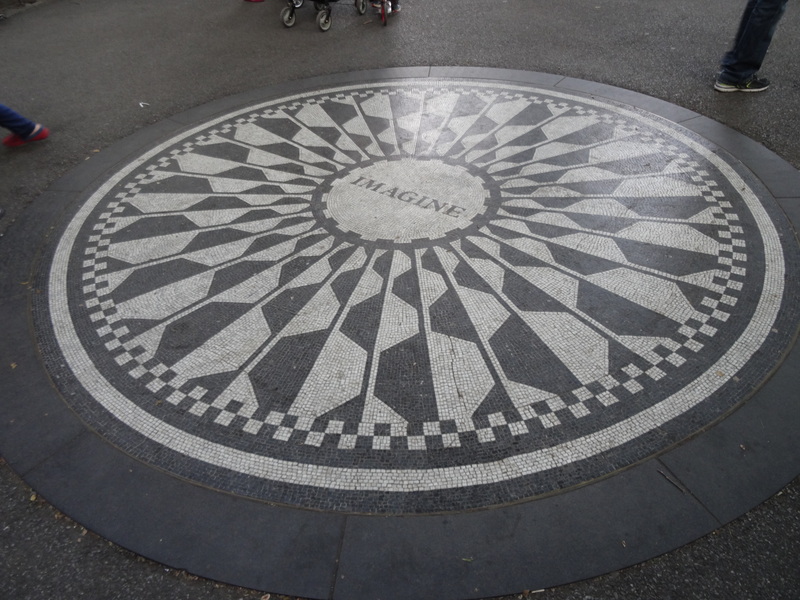 But once we did, we took note to make sure to look for it on the return walk to the subway. 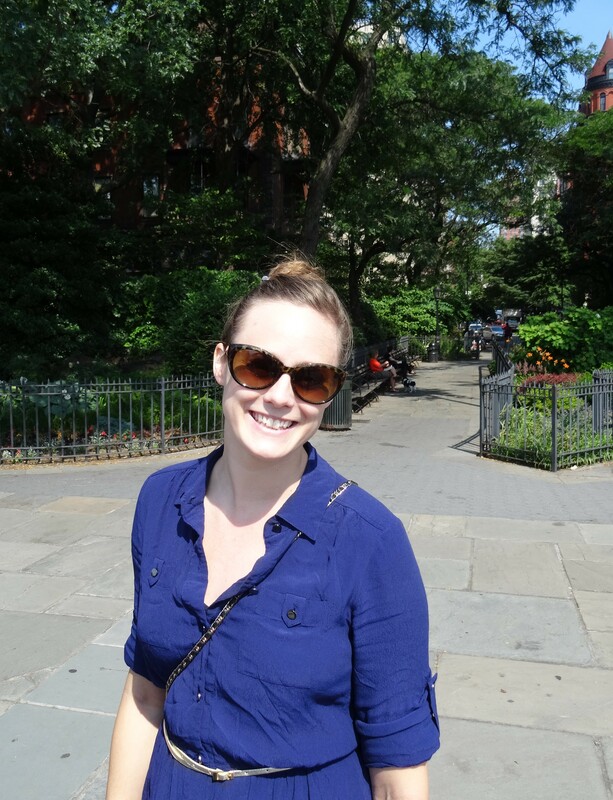 I liked the feel of the Chelsea neighborhood, and was surprised to see a lot of families there. I imagine that it has changed significantly since its storied days of the 1970’s rock scene. 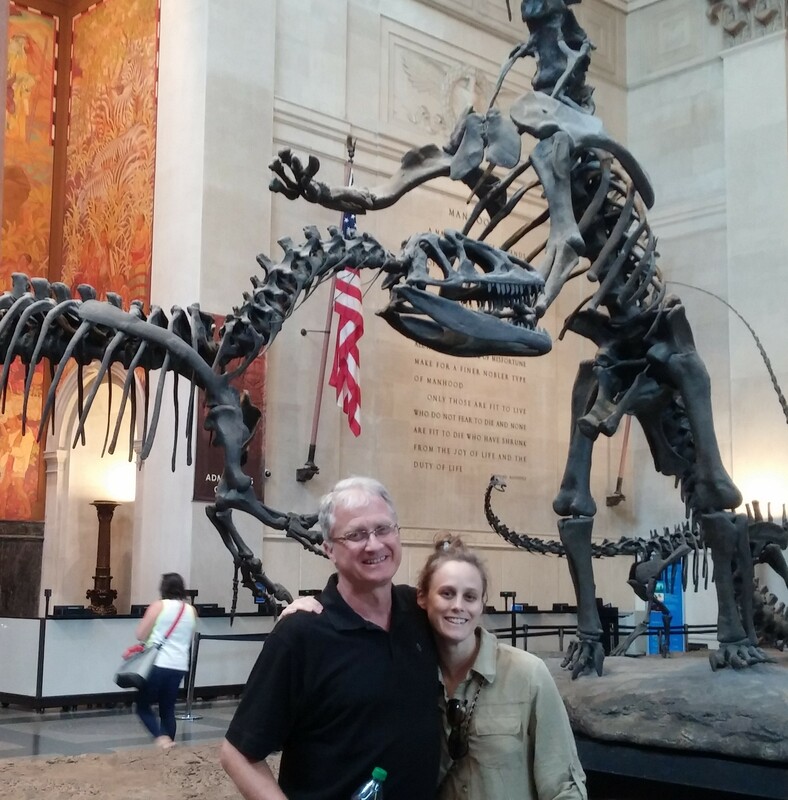 The Museum of Natural History was Trey’s museum of choice for his birthday. We arrived in the late afternoon so were not able to make all the exhibits, but did enjoy quick tours of the mammals, ocean life exhibits, native art and artifacts, and a 3-D film Mysteries of the Unseen World. It was evident that a return trip would be necessary, because we thoroughly enjoyed what we did see, which only scratched the surface of what the museum offers. Trey selected a nearby Italian restaurant for dinner to round off his day. It was a great ending to his birthday and our last night in New York! Getting to share the day with our daughter made the day even more special!